If you're a project manager, you're going to love the new update! ActiveCollab 5.9 brings two new reports that'll help you better manage your resources and team workload. 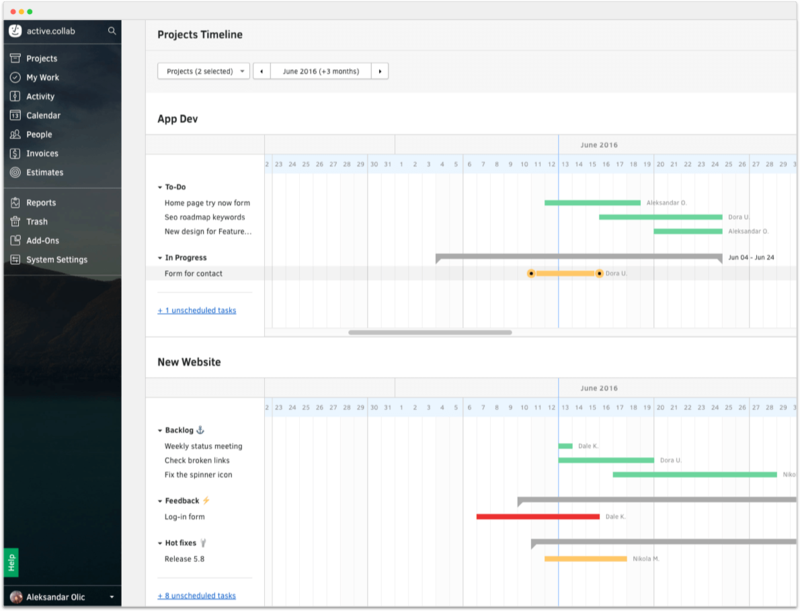 The Projects Timeline Report lets you see multiple projects on a single page. As a project manager, you’re probably running multiple projects simultaneously. In order to best allocate your resources and prevent bottlenecks, you need to have a good overview of all projects and tasks. You need to see how much work is ahead and plan accordingly. For example, let's say Design lasts 5 days and Development is immediately 7 days after. But what if you have more than 40 projects like that at the same time? You don't want your developer to end up with several overlapping projects next week. This is where the Projects Timeline comes in handy. It shows you how projects stack up against each other and where your milestones are. 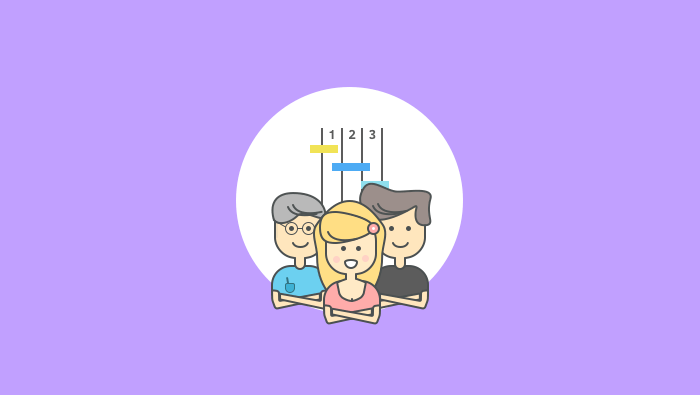 This can help you spread out tasks appropriately and overloading your team. Using the Projects Timeline, you can plan three months ahead, while making sure all the tasks can be completed on time without demanding overtime work from your team. To use the report, first choose which projects you wish to see. You can then collapse task lists and move tasks' start and end dates directly on the timeline. You can even plan collaboratively by getting your team together in front of a TV and going through all the projects together. You can also use the report when you're talking about deadlines with your client. It can be difficult for them to visualise time and work, but once they see the timeline, you won't have any problem agreeing on dates. Just select the projects for that client, take a screenshot, and send it to them. The Team Timeline Report lets you keep an eye on who does what (and who has free time). It's similar to the Projects Timeline, only it groups tasks by an assignee and lets you see estimated vs tracked time for each task (plus if someone worked on a particular task longer than they should). While you're planning a project, you can quickly see if someone has tasks already assigned to them in another project. So, you first do the scheduling on the Projects Timeline, and then use the Team Timeline to assign people to tasks, while making sure that no person has too much work at any time. You can manage a person's tasks directly from the timeline and rearrange the dates so all their assignments don't fall under the same date. This report also gives you a quick overview of all the tasks someone has that day. 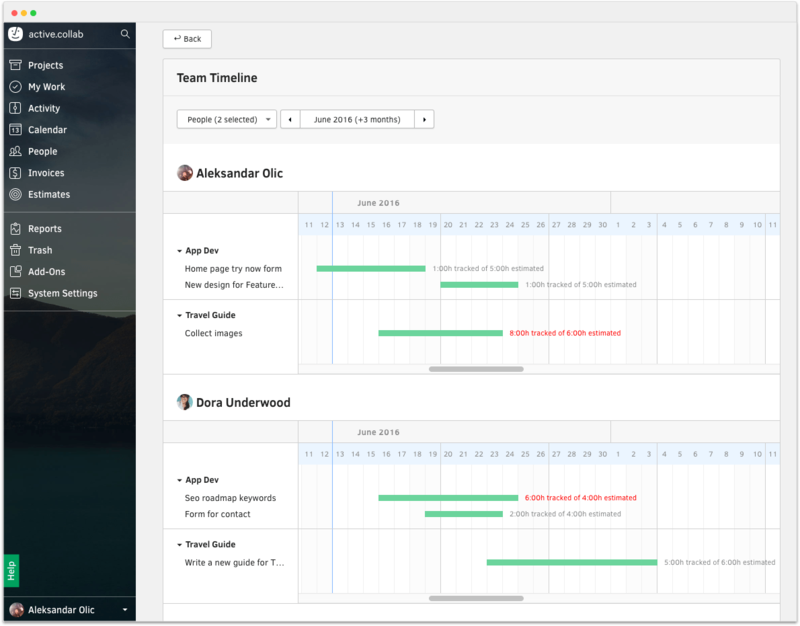 With the Team Timeline, you can create more realistic project plans because you'll know how busy each team member is. You can even determine if and when to start a new project based on this information. Using these new features, you can plan for a week or a month ahead, taking into account multiple projects and how they interact. If you have an idea on how to improve those reports to make them more helpful, leave a comment. We'd love to hear how ActiveCollab can help you be more productive. Want to learn more on project management? Check out our free guide on managing digital projects.